In the African nation of Rwanda, the spirit of peace is so needed just two decades removed from a civil war and genocide. Mary Fanaro, the director of the charity OmniPeace, recently visited there. Her organization helps communities overcome poverty by enhancing education. Father Joseph Otto of Magwi, South Sudan holds mass every day, even if no one attends. If only all of South Sudan, or everywhere for that matter, could hear him when he reads “Blessed are the peacemakers” from the Gospel of Matthew in the Bible. For what South Sudan needs more than anything is apostles of peace. Conflict threatens South Sudan a year after it gained independence. There is fighting with its northern neighbor Sudan, which is causing a major humanitarian emergency with hundreds of thousands of refugees. The UN World Food Programme (WFP) is airlifting food to the displaced, including Plumpy’Sup to prevent the wasting of thousands of infants. The longer the conflict goes on the greater the humanitarian nightmare. There needs to be a demilitarized border zone between South Sudan and Sudan and safe humanitarian access to reach all of the suffering. There is also internal conflict. In Jonglei, the largest state in South Sudan, 24 soldiers were killed last month in attacks from an insurgent group. Last year fighting between the Lou Nuer and Murle tribes escalated. People were killed or kidnapped, homes burned to the ground, and thousands displaced. The tribal violence is not the only threat, though. Flooding has also struck Jonglei, causing more displacement and suffering for at least 68,000 people. The UN is continuing to assess this latest development as it tries to deliver humanitarian aid. The road to peace in South Sudan has many twists, turns and rocks that have to be navigated. It starts by ending conflict among rival tribes, the theme of a series of peace conferences this year. It’s more than giving rival tribes a peaceful way to resolve differences; it’s also ending the hunger, poverty, and lack of education that cause desperation and chaos. A society cannot develop if its citizens are hungry and malnourished. In fact, malnutrition can stunt someone early in life to the point that they never recover. South Sudan needs national infant feeding and school lunch programs. The World Food Programme provided 355,000 schoolchildren with meals and take-home rations during July, a hopeful sign for South Sudan, particularly if this is the start of a self-sustaining national program. A system of roads needs to be built connecting all corners of the country. These are the foundations of peace, development, and a sound economy. Small farmers must be allowed to grow their crops in peace. Once the guns fall silent and disappear from South Sudan there is no telling how much the country could achieve. Other countries can continue to offer help, but ultimately the answer must come from the peacemakers within South Sudan. Yesterday, I spoke to a great class at the College of Mount St. Joseph about the fight against hunger, both at home and abroad. We talked about proposed budget cuts in the Congress to food aid programs. TEFAP: The Emergency Food Assistance Program which supports food bank across the country. If funding is reduced there will be less support at a time of high unemployment when more families need the support of food banks. WIC- Supplemental Nutrition for Women, Infants and Children. Food for Peace: This is the primary tool the U.S. has in fighting global hunger. This program was started during the Eisenhower administration and has saved countless lives and promoted stability worldwide. McGovern-Dole program: This is geared toward international school meals. Agencies like Catholic Relief Services, World Food Program and others apply for McGovern-Dole funding to run school lunch programs in developing countries. “For every one dollar that the U.S. government spends, roughly one-tenth of one penny goes towards food aid. Completely eliminating food aid would do virtually nothing to impact either our debt or deficit. And it would not relieve Congress of the need to make the difficult choices required to alleviate the debt crisis. As Congress decides exactly where to make cuts, we urge them to do what’s right for children. Disproportionate and unjustified cuts not only hurt children today, they put our future at risk and move America further away from its values. You can reach your elected officials by visiting www.house.gov and www.senate.gov. You can let them know what you expect them to be doing about food aid both at home and abroad. Tonight the NFL season kicks off with the last two Super Bowl champions facing off — the Green Bay Packers and New Orleans Saints. Green Bay is fresh off its victory over the 6-time Super Bowl champion Pittsburgh Steelers. Aaron Rodgers is now established as one of the elite quarterbacks in the NFL. Saints QB Drew Brees is again leading the Saints prolific offense. But this former Purdue grad has already been taking the lead on famine relief for East Africa. Brees has partnered with the UN World Food Programme, raising awareness of the plight of millions of starving people in East Africa. Massive drought in Somalia, Ethiopia, Kenya and other parts of the region has caused severe food shortages, putting over 12 million people at risk of starvation. Brees made a special famine relief poster available at the World Food Programme’s (WFP) web site. There is also a Drew Brees and WFP fundraising page set up for East Africa. This is a great way for football fans and teams to get involved and help East Africa through its hunger crisis. Football teams at any level are encouraged to display the famine relief banner at games and on team web sites, etc. Fans and teams can do things, like pledge donations per each touchdown or any type of fundraising ideas to help WFP, which relies on voluntary donations to feed the hungry. The football community can do great things to help East Africa recover from this great crisis and write another chapter in the American epic of humanitarianism. 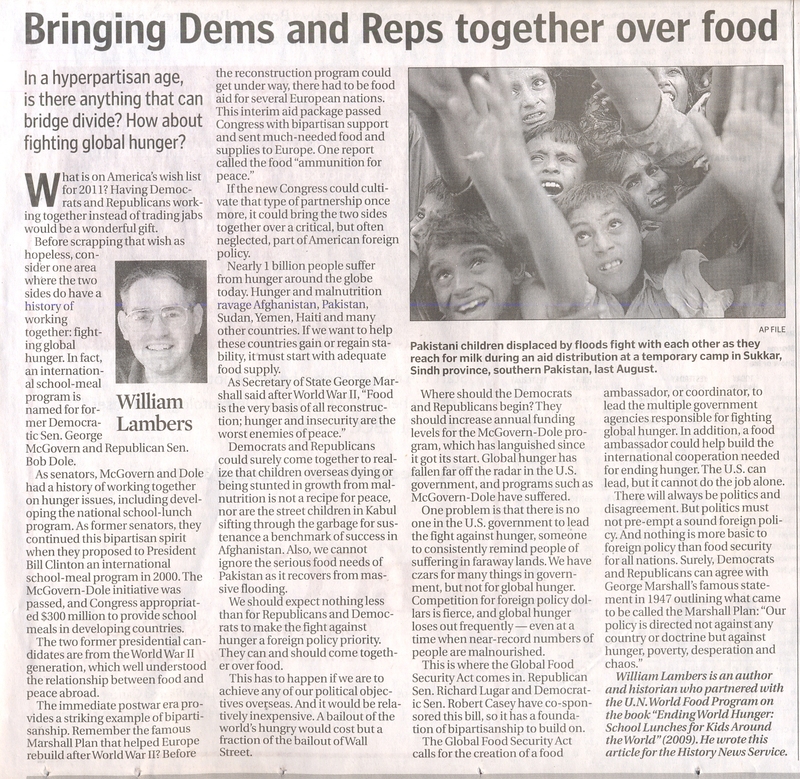 Article first published as Senate Urged to Support Food for Peace Program on Blogcritics.